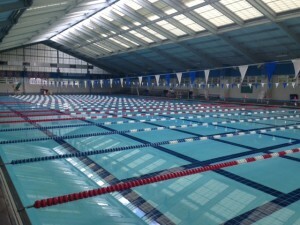 The Aquatics Division of the Parks and Recreation Department has two swimming pools that are open year around to the public, the Biloxi Natatorium (pictured above) and the Donal Snyder Community Center. These two facilities offers lap swimming and include dressing rooms, restrooms, water fountains, and drink machines. In addition, the Aquatics Division offers swimming lessons, lifeguarding classes, swim teams, and other services including memberships. Begins May 4, 2019 from 8 a.m. to noon at the Biloxi Natatorium. NEWS: To see a WLOX story on lifeguarding and swimming lessons, click here. To see images from the swimming event of the National Veterans Golden Age Games held at the Biloxi Natatorium in May 2017, click here. Visit the Biloxi Natatorium page for all of the information, including fees and requirements.